Regularly checking your system for damage and testing its safety sensors should be routinely performed to ensure its proper operation. Our experienced technicians can save you time and effort by handling that, and much more in the process. 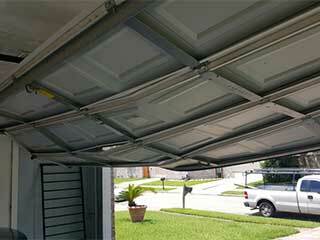 Every modern garage door is automated, which requires them to foster special safety features. Our job is to ensure that they work effectively. Testing the spring and adjusting its tension, for example, are two of the many important tasks we perform. These tests do more than ensure smooth opening and closing. They also help in preventing unexpected damage from impacting your system. Such damage can result in a broken spring, which can be highly dangerous. Another safety check we perform is testing your opener's sensors, which we replace if they fail to function properly. We also adjust the opener’s force and travel limits, to keep your door from hitting the floor while it's closing. You can rely on our professional team to closely inspect your garage door's panels for damage. We are experts in rust removal and repairing decayed wooden panels. Our technicians also lubricate the springs, rollers and hinges to ensure smooth and quiet performance. If we encounter any problem, you can count on us to resolve them on the spot. If you have a bent track, we’ll straighten it and align its sections to prevent future issues. In case a cable has become frayed, we’ll replace it with a new one of the same strength, design and size. Our services vary when it comes to scheduling each session. The frequency our technicians will visit you depends on the age, model and overall condition of your system. We also take your preferences into account, obviously, and we make sure the time and date that we set is convenient for you. Call our Garage Door Repair Santa Monica experts today, to help make sure your system keeps functioning for many years to come!